I knew Gordon Porteous as a fellow member of the Scottish Marathon Club – the difference was that he was a founder-member and I only joined in 1961! The first time I was conscious of him in a race was my first long road race at Dunblane when the group refereed to by Emmet Farrell as ‘the geriatric rat pack’ came past me at about 11 miles with a query as to my well-being. Emmet himself, Andy Forbes and Gordon were in the group of four or five. I subsequently met him at various races and, of course, at SMC Presentation Dinners, usually held in Glasgow. 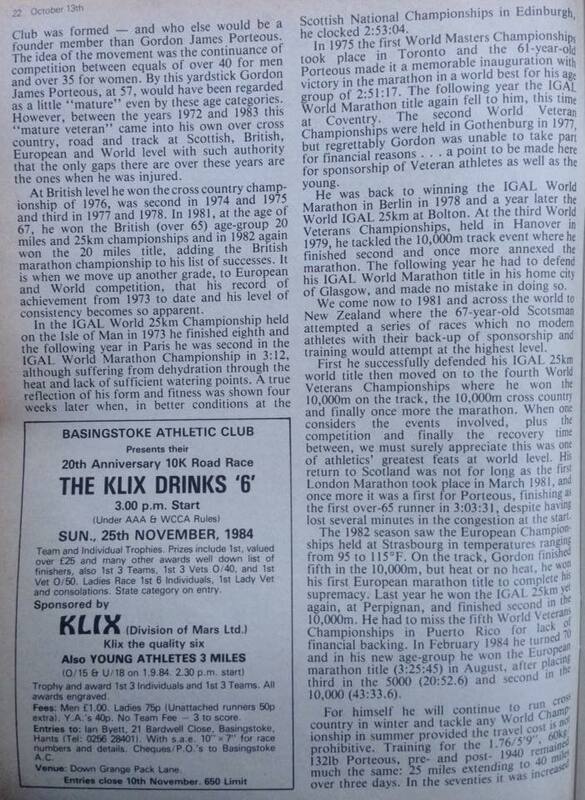 A fine runner when he was a young man he became a world champion as a vet and the following excellent profile was written by Colin Youngson. In 1946, after a trial race, Gordon Porteous was selected to run for Scotland in the ICCU Cross Country Championship in Ayr. He finished 43rd as one of his country’s counting team. That was the year when the first Scottish Marathon Championship took place, although Gordon did not take part. However he provided useful information which is quoted in ‘A Hardy Race’. “After the war, dietary problems included digesting dried egg and getting hold of enough food to sustain us. Runners lucky enough to be ‘possibles’ for the 1948 Olympics received food parcels from South Africa, courtesy of the AAA. Survivors of the Saturday long run replenished reserves with Bovril (served in special club Bovril mugs) and cream crackers or a pie. Maryhill road men had one advantage over their rivals. Dunky was a member of the Home Guard. The crafty fellow obtained a supply of heavy brown Army plimsolls, which had much thicker rubber soles than the usual ones. More cushioning and fewer blisters. The alternative was Dunlop Green Flash – a tennis shoe which would ensure blood on the road for its masochistic owner. This brand was still used in the 1960s! Other kit comprised shorts, a vest, grey flannel trousers for the warm-up and a jersey with long sleeves to be pulled down over the hands on cold nights. Training was usually thirty miles a week. Maryhill Harriers (motto: ‘Good Fun – Good Fellowship – Good Health’) ran together from Maryhill Baths on Tuesdays and Thursdays – about seven miles a night. There might be a slow pack and a fast pack, each one with a Pacer and a Whip. A good deal of wisecracking could be heard, especially as the fast pack whizzed past, unless runners were breathless. On Saturdays, if there was no race, a pack of runners might cover fifteen or even eighteen miles over road and country, followed by tea, buns and a singsong to the music of mouth organs etc. An alternative was some serious hiking. By 1948, Gordon was ready to have another go at the marathon, and improved to 5th in the Scottish Championship at Dundee, finishing in 2.54.11. Now one of several reasons why Gordon Porteous must feature on this website, is that he was still breaking the three hour barrier in 1981 at the age of 67! (He stated that his so-called ‘failure’ to run as fast after then, was due to a hamstring injury sustained while track training for the 10,000 metres in the European Veterans Championship in Strasburg.) Between 1949 and 1969 he contested only eight marathons (PB 2.49.23) and dropped out of three of them. However he ran two in 1970 and never missed the Scottish Senior (or Veteran) Marathon Championship between 1972 and 1982. At the age of 60 in 1974 he ran 2.53.08 and in 1975 two M60 World Marathon records: 2.51.35 in the Scottish Senior and 2.51.17 to win the inaugural World Veterans Championship in Toronto. This was nearly three minutes faster than his 1948 effort! Gordon Porteous went on to achieve a truly marvellous series of successes. He set European and World age-group marathon records at: M65 (2.57.00); M70 (3.11.45); M75 (3.23.12); and M80 (3.47.04). He won World Veteran Marathon gold medals in Coventry 1976, Berlin 1978, Hanover 1979, Glasgow 1980, and New Zealand 1981 plus Rome 1985. A European Marathon gold medal was won in Brugge, Belgium in 1989. In 1976 Gordon actually won an amazing four World Championships in ten days. As well as the marathon in Coventry, he was first in 10,000 metres on the track, 10k cross country and 25k road! Gordon enjoyed many glory days in the company of his close friends John Emmet Farrell and Davie Morrison. The three of them travelled together all over the world to championships and broke so many records. I remember in particular the splendid and well-deserved newspaper and television coverage of those three Scottish heroes in the 1999 British Veterans Championships at Meadowbank; and the subsequent World Championships at Gateshead. Even when he was over 90 years old, Gordon said, in an interview “In a good week I manage to run 30 to 40 miles. The idea is to keep fit, although a little piece of pride also comes into it. When I began running, I didn’t imagine it would become as popular as it is today. Normally, you try to do a wee bit better each year, but eventually you reach a stage when you’re just hoping to finish!” He was married to Nettie for more than 60 years. She survived him for just two. Even now in 2010, Gordon Porteous continues to hold three world age group records: M85 5000m (24.51.7); M90 5000m (31.25.45); and M90 10,000m (69.27.5). He should be remembered as a great champion and a wonderful role model. Following Colin’s profile of Gordon above, it might be appropriate to finish with a contribution from outside Scotland as an indication of how he was seen from outside Scotland. The following comes from www.mastersathletics.net and the World Famous Athletes directory. “The Flying Scotsman” has finally come to a halt. 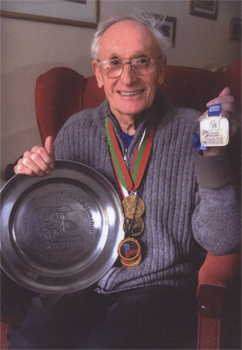 Our oldest competitive athlete, Gordon Porteous, Scottish Veteran Harriers, was laid to rest in Barrhead on 25th January, weeks short of his 94th birthday. His last major race was at Coatbridge in October 200 when he smashed the M90-94 age category World 10000m track record, winning in 69 min 26.92 sec. 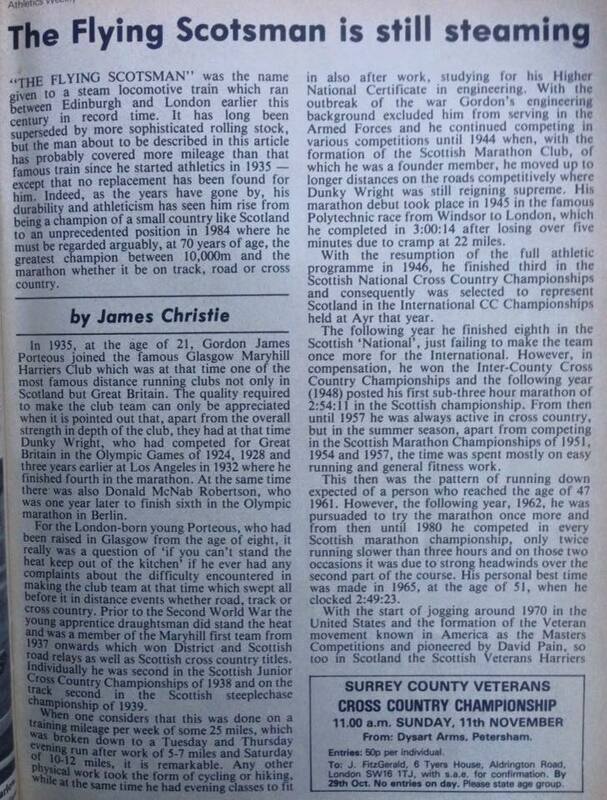 Graham MacIndoe sent a copy of the Athletics Weekly article about Gordon by Jimmy Christie of Victoria Park and it is reproduced below.